The price of platinum per ounce in dollar, euro, pound and global production. Platinum has many properties. It resists corrosion and abrasion, it does not oxidize in air and resist to chemical attack. Its melting temperature is high (1775 degrees) but it is more ductile and malleable as gold. Its main use is the industry as a catalyst or jewelry in the manufacture of jewelry. It belongs to the family of PGMs (PGM) that includes: Platinum (Pt), Palladium (Pd), Rodhium (Rh), Ruthérium (Ru), Iridium (Ir) and Osmium (Os). If the year 2009 gives me the time I’ll write a topic on the production and consumption of platinum as well as the price of rhodium to record more than 10 000 dollars an ounce (oz knowing that corresponds to 31,103 grams, it is an expensive gram). Platinum with its record to 2230 dollars an ounce in early years is not even the most expensive elements of the family of PGMs. 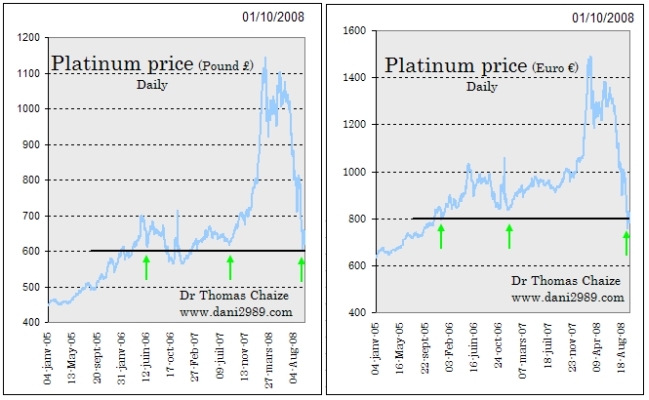 In 2003, gold and oil have captured my attention, I never had time to publish a chart on the price of platinum. Forced to make choices in a world mining in full boil, I sacrificed the price of platinum. For 5 years, I am waiting patiently for the right time to post a topic on the price of platinum and I want to say all good things that I think of this precious metal. The return to the area of a thousand dollars an ounce of platinum now finally gives me an opportunity to discuss what has been wrongly named "small silver." It is more, part of its rarity and its qualities, the big brother of gold that the little brother of the silver. A. The use of platinum. More than half of world production of platinum is used in the manufacture of catalytic converters for the automotive industry (59%), it is a catalyst in the exhaust systems to reduce discharges of toxic compounds (only 20% platinum used by the automotive industry from the recycling of exhaust pipes). Less than a quarter of production of platinum is used to make jewelry (18%). The remaining production is used in chemistry (4%), in the manufacture of glass (5%), electricity and electronics (4%) and oil (2%), only 1% of production World platinum is used for investment. Platinum is also used as a catalyst for fuel cells to convert hydrogen and oxygen into electricity. This use is marginal today, but tomorrow it could make the deck even more attractive. B. The producer of platinum. South Africa and Russia produce 90% of world production of platinum, South Africa alone accounts for three quarters of world production of platinum. It has a foreground production of platinum through the Bushveld Complex which contains deposits of platinum the world's largest. However, Russia is the first to have used its large deposits of the Urals in the early nineteenth century. At that time, it represents 90% of world production, it strikes even currencies platinum 1828 to 1845. The rest of the world's platinum is produced mainly by the USA and Canada. The platinum mines are more rare and less well distributed geographically as gold mines. C. World production of platinum. In 2007, world production of platinum was 6.5 million ounces of platinum this represents less than twelve times world production of gold (80.3 million ounces of gold) and 100 times less than the world's silver (659 million ounces of silver). II. The price of an ounce of platinum in dollars, euros and pounds. A. The price of an ounce of platinum in dollars per year. No. 3 2000-2008: eight years. To be concise, the two previous waves increase, which brought the current annual average in the 1600-1800 ounce of platinum, were short waves. On the chart we see clearly that the wave began in 2000, which continues until today is different, it has much more solid foundations. I do not think this wave of expansion will be ephemeral as the previous two because the origins are different. The area of $ 600 per ounce of platinum is a major support area for over 48 years, I do not think we shall review a day this price level annual average for the price of an ounce of platinum while while the increase is still possible. B. 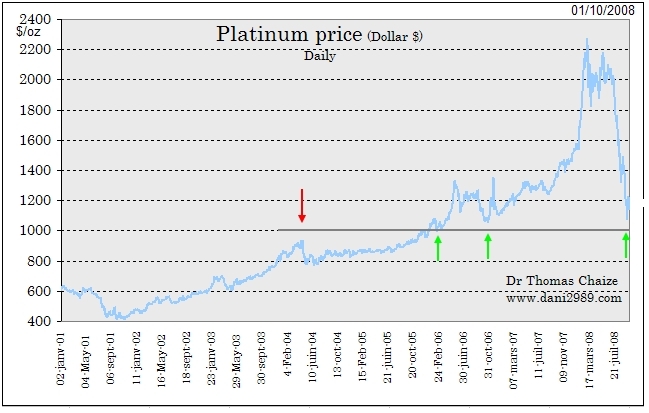 The price of an ounce of platinum in dollars by day. The price of an ounce of platinum is now slightly below the 1100 dollars, the support of $ 1,000 per ounce of platinum will be very strong, the bottom of the cup is around the corner. The $ 1,000 an ounce for platinum is support for technical analysis but also an important psychological threshold. Hard to tell exactly what level will rebound, but the area of $ 1,000 is interesting. If the support was broken in 1000 dollars it should only be a temporary and very fast although the ideal is still early to expect a rebound to buy. C. The price of platinum in euro and pound. The platinum price in pound is also an area of support at 600 pounds ounce of platinum. The record is 1143 pounds ounce of platinum in March 2008. The price of platinum in euro zone support to 800 euros per ounce of platinum. The record platinum prices in euros to 1450 euros per ounce of platinum. Aware that make 31,103 ounces grams, the price of a gram of platinum is 46 euros for the record. Today with an ounce of platinum at 780 euros, it’s a 25 euros per gram platinum and 25 000 per kilogram. Platinum is a precious metal more rare than gold, little product and very useful. Investors too often forget it, in 1000 dollars, 800 euros and 600 pounds ounce of platinum it deserves much more attention.